As we settle back into a fall schedule, it’s time to go back to the sewing room (as if I took time off!). More specifically, it’s back to school time for sewists too! The fall schedule is up at Rock Paper Scissors, where I’m teaching a full roster of skill builder classes, including HSTs, quarter circles, log cabins and walking foot quilting. I’m also teaching two classes in a partnership between RPS and the Monclair Art Museum— one on eight Wednesday mornings about inspiration and execution from the museum’s mid-century quilt exhibit– and the other a two-Saturday overview of the entire quilt-making process. All the information about classes and registration are on my class page. I’ll also be at a color story workshop at the museum led by the one and only Amy Butler. I hope that if you’re in New Jersey this fall you’ll think about signing up. I’m really proud of this one. Check back for the story before Cirrus Solids and the hexies make their big debut at Quilt Market. Until then, I’m always on Instagram as @melintheattic. That quilt is amazing!! I can’t wait to see the whole thing!! Holy smokes! 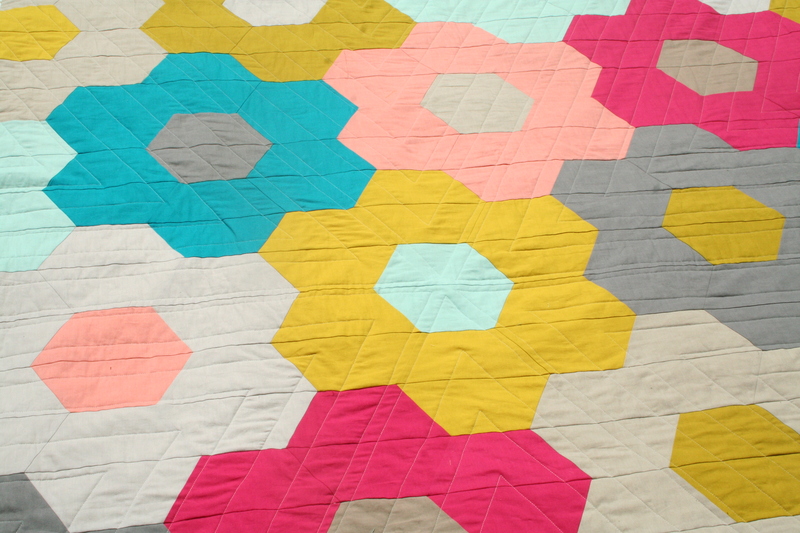 I am so loving the quilt and can’t wait to see it at Market! And, of course, getting so excited for your upcoming classes at RPS and MAM!!! Wow love it. I hope you have this entered in Quilt Con? It’s very pretty! Can’t wait to see the whole thing.